C Corporations, Subchapter S Corporations, LLC's, sole proprietorships and Partnerships are a complicated subject. The liability of a corporation or LLC is limited to the value of its assets. Apart from 'flow through' entities corporation tax is quite onerous, hence we see a rich variety of corporate structures and trusts to mitigate this burden. 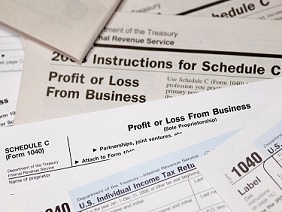 A Sole Proprietor simply files Schedule C with his or her 1040 return. The important point is to retain accurate records and all supporting documents for at least four years. In normal circumstances the IRS goes back three years but your state may go back further, for instance California, may go back four years. For Fraud there is no limitation. Partnerships file Form 1065 with a K1 for each partner. Keep a vehicle log showing whom you met, the purpose and the mileage. Also keep a record of your annual total mileage from your odometer and what you paid for the car. 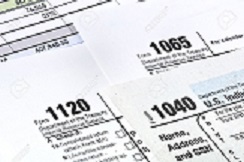 If your wife is your partners, you do not need to file Form 1065, you should file Form Schedule C for each of you. This allows both of you to pay into social security and medicare. C Corps - Form 1120 - pay corporation tax up to 35% and the recipients of dividends from a C Corp pay tax on the dividends, hence the problem of double taxation. In order to collect more tax, the IRS may well impose an accumulated earning tax of 20% on profits retained, that is not distributed, beyond the reasonable business needs. S Corps - Form 1120S - as a rule do not pay tax. All S Corp profits flow through to the members who pay tax on the K1 they receive. An S Corp may have no more than 100 members all of whom must be US residents. If a trust is a member, it counts as one member. Failing to file annually results in severe penalties and interest. Before you can dissolve the LLC or Corporation, you need to file tax returns for every year the entity existed and pay the penalties. Even if you register your LLC or corporation outside your state of residence, in California at least you need to register your company to do business in California and pay the Franchise Tax Fee. If it is less expensive to pay a tax lawyer than pay federal and state tax, you will see that the tax code is fertile ground for creating new entities and structures. For instance, if an international can avoid paying the 35% corporation tax, by not remitting international profits to the US, they do so. Let's look at them. Personal Service Corporations. Rather obviously, these are companies formed to provide personal services such as law, engineering, accounting etc. They pay 35% tax like C Corps. Tax exempt companies. These are formed subject to Sections 501 and 528. They need an EIN they normally have to file a return. Churches and certain charities are tax exempt under the same section.